These books are some of our family favorites and many have a place on our living room bookshelves. We hope you will enjoy them, too! The Garden Wall. By: Jennie Bishop. A sweet story of friendship which could be used to introduce courtship. 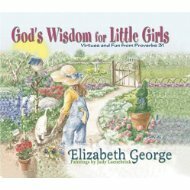 God's Wisdom for Little Girls: Virtues and Fun from Proverbs 31. By: Elizabeth George. His Little Princess: Treasured Letters from Your King. By: Sheri Rose Shepherd. A devotional book of encouraging letters from God to your daughter. Lessons in Responsibility for Girls, Level 1 (also known asHome Economics for Home Schoolers). By: Anne White. Simple projects with instructions that teach basic skills of keeping a home. I'd Be Your Princess: A Royal Tale of Godly Character. By: Kathryn O'Brien. A perfect read-aloud for dads and daughters. Just Like Mama. By: Beverly Lewis. A story of a daughter who wants to be like her mama, but mama insists, "Let's just be like Jesus." Let's Have a Tea Party: Special Celebrations for Little Girls. By: Emilie Barnes. Plans and recipes for six themed tea parties. A Little Book of Manners: Courtesy and Kindness for Young Ladies. By: Emilie Barnes. This book is perfect for girls ages 5-10. A Little Princess in the Making. By: Emilie Barnes. A beautifully illustrated book to teach manners. I recommend this book for preschoolers or kindergartners. The Person I Marry: Things I Think About Long Before I'll Say, "I Do." By: Gary and Jan Bower. Husband Gary wrote the sweet rhyming text and wife Jan painted original illustrations based on their own children. My daughter wants to read it to the children who attend her wedding. The Princess and the Kiss: A Story of God's Gift of Purity. By: Jennie Bishop. A story that encourages little girls to save and treasure their first kiss. The Prayer That Makes God Smile. By: Stormie Omartian. 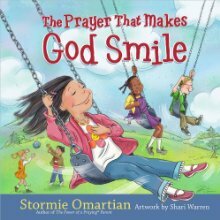 Helps parents lead their child into praying a prayer of salvation, the prayer that makes God smile. The True Princess: What Makes Someone a True Princess in Jesus' Eyes? By: Angela Elwell Hunt. My absolute favorite. A beautiful parable explaining that a true princess is one who serves. When I'm a Mommy: A Little Girl's Paraphrase of Proverbs 31. By: Ginger Adair Fulton. A Young Lady of Valor: Proverbs 31 for Girls. By: Pam Forster. A coloring book of Proverbs 31 illustrations. Copyright © 2018. Daughters4God. All rights reserved.